This letter by William Clark, the Superintendent of Indian Affairs, was written to the Secretary of War, Lewis Cass. 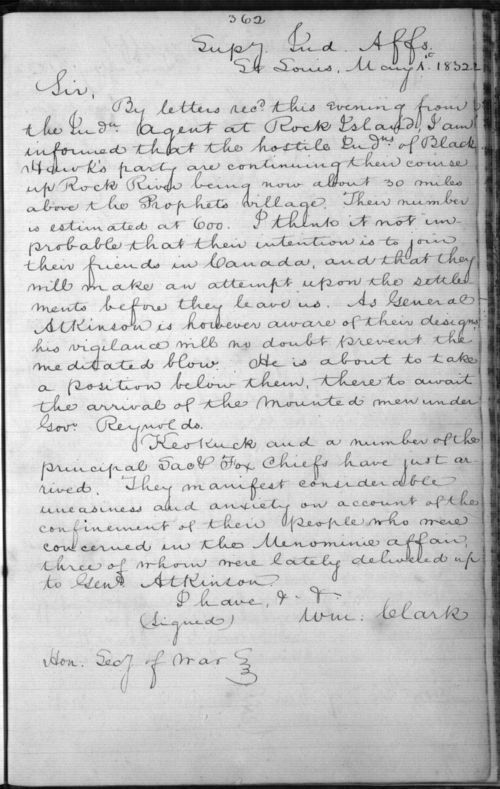 In it, Clark expresses his concern about the Sac and Fox warrior Black Hawk and his followers, who have refused to move from their lands in Illinois to their new homes in Indian Territory (what is present-day Kansas). Clark fears that these natives will attack nearby white settlements. The tribe had ceded their land east of the Mississippi to the U. S. government in 1804 and 1816. This letter refers to the native resistance toward removal that would later be known as Black Hawk's War. This informative letter could be grouped with other documents concerning the Black Hawk War and Indian resistance to removal; in particular it would fit with two other letters from the William Clark Papers, dated May 20, 1829 and April 24, 1832, and Black Hawk's portrait, all of which have been selected for this standard.